According to a survey released by People Management, about half of HR professionals are biased against overweight women while nearly 40 percent are biased against men. The specialty bias tests conducted on survey participants assessed associations of gender and competence and found that 37 percent of respondents revealed a negative male bias where only 1 percent showed a prejudice against women. However, 51 percent of respondents held an unconscious bias towards overweight women that would be likely to affect their behavior toward these women. 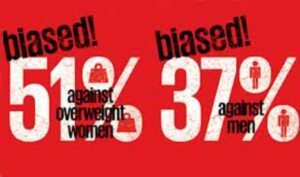 Just 4 percent of respondents showed a bias against slim women. One of the more surprising discoveries of the survey was the extent of prejudice of men against men. Nearly 16 percent of male HR professionals expressed an anti-male bias where 0.5 percent of women demonstrated an anti-female bias. Also shocking was the finding that 7 percent of respondents showed a bias against people with disabilities with 25 percent demonstrating a strong or very strong prejudice against them. The one positive aspect uncovered by the survey was that almost 75 percent of participants had no bias against age though there was prejudice, especially towards candidates over the age of 55. In fact, 5 percent of respondents revealed a strong bias against older candidates compared to 1 percent against people under 25.